When you've been to Portsmouth and Southsea several times before, where else is left to visit? From outside it's not immediately obvious what this building on Portsmouth's harbourfront is. 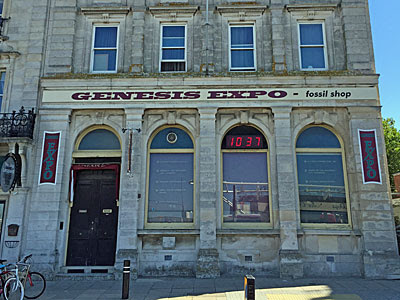 A fossil shop, it says, although the reference to Genesis turns out to be rather more pertinent. For this is a Creation Museum, the UK's largest, whose agenda is to promote the Bible's six-day origin story by debunking evolution. It's a ridiculous theory, apparently, and there are firm scientific reasons why everything Charles Darwin proposed must be wrong. As well as a shop full of fossils and minerals, the model of a 20ft dinosaur called Boris lurks just inside the door to help lure the open-minded within. But proceed a little further, or scan the bookshelves more carefully, and the true nature of the premises becomes more clear. A dozen-or so cases of evidence twist round in the dark space beneath the upper landing, each dismissing some 'fact' evolutionists hold dear, or providing some alternative explanation. Fossils look just like today's creatures, we're told, which is firm evidence that species remain unchanged. Marine sediments can be laid down really quickly, like when there's a landslip or something, and rapid sedimentation 'explains' why the burial of fossils didn't take millions of years. Mutations 'always' result in a loss of genetic information, so there's no way any complex modern plant or animal could be the result of one. Indeed there can't have been any new species since the creation, only species lost to extinction, despite what 'Neo-Darwinism' claims. 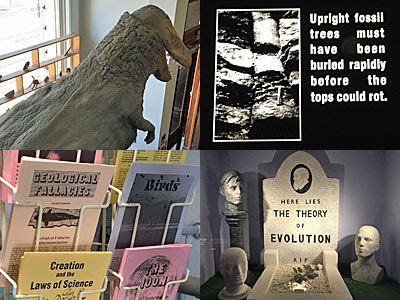 By the time a gravestone pops up claiming 'Here Lies The Theory of Evolution RIP', you can almost hear the exhibition's creators shouting 'QED'. Upstairs is a looping video, with the volume down too low to hear, and a somewhat optimistic number of chairs. There are also a couple of spinny racks brimming over with photocopied leaflets on diverse topics the Creation Science Movement think deserve explanation. 'How Old Is The Earth?' 'Evidence for Noah's Ark and The Flood' 'Geological Fallacies' 'The Stooping Rhodesian Man Fraud' 'Plant Geneticist Says No To Evolution' Each leaflet costs 15p, presumably to dissuade unbelievers from taking one of each for a laugh, although the CSM's journal and a leaflet aimed at children are available free. To my eye all of this is ill-founded rubbish, but I was struck by the museum's delivery of seemingly cogent argument which the less critical could easily take as cast iron truth, and I imagine a Climate Change Denial Expo would feel quite similar. I deliberately resisted kicking off a discussion/debate/argument with the two volunteers on duty - they seemed perfectly happy chatting with each other. The only other visitors were a mother and her young son, he excited by the scientific treasures in the gift shop, she steering him away from the children's books and DVDs with steely resolve. No attempt at conversion was made, indeed the approach was politeness itself, but one wonders how many people wander in after a trip to the neighbouring Royal Dockyard without quite realising what they're being 'sold'. Located on the Esplanade between the Canoe Lake and the Rose Garden, this unlikely 1950s survivor is a charming reminder of a gentler past. 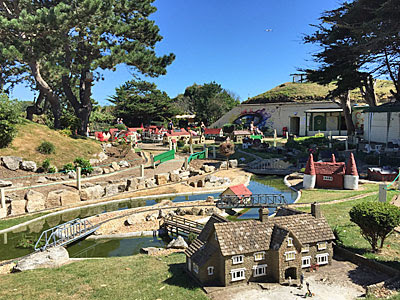 A third of an acre in extent, Southsea Model Village is concealed inside a coastal defence called Lumps Fort, its name spelt out in white pebbles on the mound below a scaled-down castle. The main entrance doubles up as a snack bar, seemingly more popular amongst the families playing outside, but look carefully for the sidegate and just £3 will let you through. The village is built to 1/12th scale and contains a fairly motley collection of buildings from a church and watermill to shops and cottages. A few have bits missing or aren't in the very best nick, but there's a reason for this which is that a new set of owners took over this year, just in time to celebrate the village's 60th anniversary. They had to tackle long-term neglect, and a sad case of vandalism over Christmas, but are giving the place some 'love and attention' as proven by a fresh lick of paint all over. The compact site also boasts five model railways of various lengths, weaving around the site, under the path and across the water. In Bekonscot-style many of the businesses depicted have punning names, for example the blacksmiths are I Cloutim and E Bellows, while the brewers are Stagger & Tripp. Meanwhile various period figurines add a further human touch, not least the cluster of traffic wardens gossiping in the centre of the high street. The fort's upper mound makes a useful picnic area overlooking the Solent, while the space underneath has been put to an unusual use. 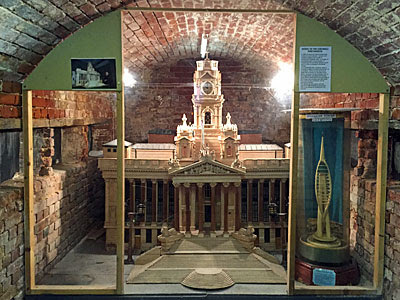 A few years ago volunteers dug out the 125ft Rifleman's Tunnel leading to the heart of the caponier, at the end of which is a small chamber containing a giant model of Portsmouth Guildhall. Local pensioner Ron Breadner built it out of matchsticks over a 14 month period and donated it to the city council, who in turn offered it to the model village where it now sits behind glass buzzed by the occasional trapped fly. Alongside is George Betteridge's 33 inch-high matchstick model of the Spinnaker Tower, now half-buried here after a mere week on show at its full size namesake. And if you've ever wanted to see a matchstick windmill built by a one-armed Croydon fishmonger, a shed outside provides your golden chance. I spent more than twice as long at the Model Village as at the Creation Expo, and smiled rather more too. The target audience is obviously families with small children, as those circulating alongside me attested. But connoisseurs of miniature nostalgia will find much to delight, if they don't set their sights too high.